Tsohost Review 2019: Is Tsohost a Good Hosting? Tsohost, a U.K.-based web hosting provider, has grown steadily since 2003. They’re most well-known for their affordably-priced and feature-packed shared and cloud hosting plans, and they now serve over 160,000 website owners. Tsohost, a U.K.-based web hosting provider, has grown steadily since their inception in 2003. They’re owned by Paragon Internet Group, the corporation that also runs Evohosting and daily.co.uk. They’re most well-known for their affordably-priced and feature-packed shared and cloud hosting plans, and they now serve over 160,000 website owners. The 500MB of disk space may seem somewhat restrictive, but it should be sufficient to establish a basic online presence, or even host a small blog – if you’re going with the latter, you’ll particularly appreciate the unlimited bandwidth. Plus, most entry-level plans in this price range typically don’t come with a free domain registration or more than one mailbox, so getting these thrown in boosts the value of the plan quite a bit. Additionally, some web hosting providers will charge you for their website migration service – Tsohost handles it for you at no cost. The free daily backups are another nice perk to have, particularly if you’re on WordPress. There are so many things that can go wrong with a WordPress installation because of the number of third-party scripts involved, so being able to easily restore your website to the last working copy is important. Tsohost also has a range of VPS, private cloud, and dedicated server hosting packages, so as your business grows you can still remain with the same provider. Tsohost has a 99.9% uptime SLA. If there’s any dip in service below this, you’re eligible for credit equivalent to a full week’s cost. This does come with a few caveats though. For instance, you won’t automatically get the credit; you have to specifically request it. Secondly, if you have any overdue invoices on your account, the SLA isn’t applicable (fair enough). The final condition is similar to the second, but more irritating: if you pay the invoice for the period of disruption late, the SLA doesn’t apply either. That said, it appears that this may not be necessary, as my tests indicate that Tsohost maintains a 99.98% average uptime, which is definitely above the norm in the industry. They also boast superior loading times, as websites hosted with them load 32% faster than those with competing providers. Tsohost’s shared hosting plans vary in pricing depending on the storage space, number of domains, and number of email accounts you require. And, unlike many other hosting providers, their prices are transparent with no hidden costs – so you don’t have to worry about registering for a contract only to realize that the price was too good to be true. That said, their most basic Personal plan range does require you to sign a service term of at least one year – this is laid out clearly on the plan comparison page, so there are no tricks or hidden costs. Tsohost doesn’t have a free plan available, but they do offer a 30-day money back guarantee on all shared hosting packages. Note that the refund isn’t automatic: you’ll have to first cancel your plan in my.tsohost, and then email support within the first 30 days of opening your account. Of course, if your plan includes a free domain name, you’ll be liable to pay for the yearly cost of that domain. Also to keep in mind – Free SSL certificates are only valid for 3 months. After that, you need to pay. Tsohost offers 24/7 support via a ticketing system in the my.tsohost account management portal. Alternatively, they do have extended live chat and phone support hours, but this is best suited to U.K. customers – users from other time zones may find their support hours rather limited. When I called them late in the day during U.K. time, I was on hold for only a couple minutes before a customer support representative connected with me. The agent answered my semi-technical questions clearly and without getting into too much jargon, which is good news for those not as familiar with web hosting. Tsohost also has an extensive knowledge base, so you can diagnose technical issues yourself. 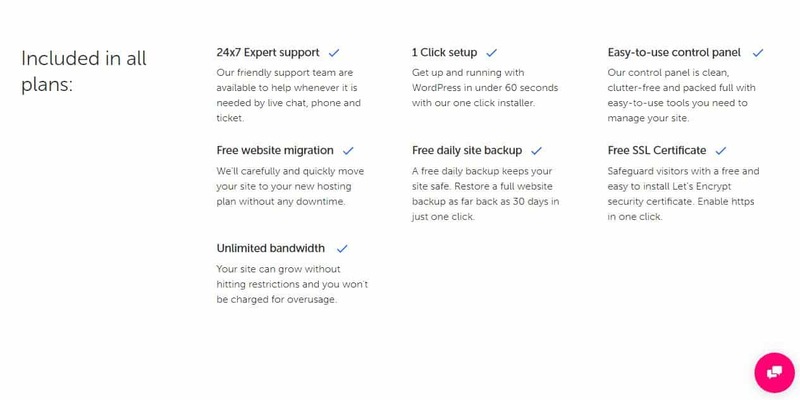 With such honest and transparent offerings, it’s little wonder why Tsohost has grown steadily to become one of Europe’s preferred WordPress hosting providers over the years. If you live in the U.K. and are looking for a reliable, affordable high-performance web host, Tsohost is definitely an option worth considering. Wondering how Tsohost stacks up against other Web Hosting companies? Enter any other Web Hosting company and we will give you a side-by-side comparison.